I really enjoyed the scenery and terrain on my Saar-Hunsrück-Steig walk in 2014, which ended at Idar-Oberstein in the Hunsrück. Another long-distance trail starts nearby, about 10Km from Idar-Oberstein. This is the Soonwaldsteig, a certified "Premiumwanderweg", opened in 2009. 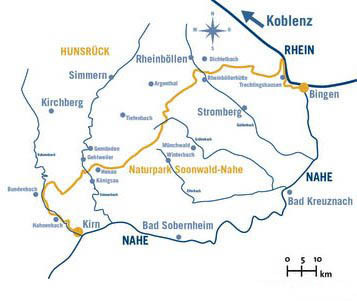 Starting at Kirn on the River Nahe, the six stages of the 85Km long trail takes one through the Soonwald-Nahe Naturpark, then through the Bingerwald to end at Bingen on the Rhein. The stages from Rudolfshaus to Rheinböllen run through remote valleys and along mountain ridges of the Soonwald, away from main roads and villages. This presents an interesting logistical challenge. Originally, I intended taking camping gear to use on the second, third and fifth stages. Although wild camping is prohibited in Germany and especially so in a Naturpark, camping facilties have been provided for thru-hikers by the establishment of three "Trekkingcamps" in the Soonwald. I eventually decided against camping as I've developed some arthritis in my right hip and was worried that carrying a heavier load for 6 days may aggravate it. Consequently, I resigned myself to making long detours off the trail at Simmerbachtal (4Km) and Ellerspring (7Km) to reach overnight accommodation. It also seemed that it would be impossible to get accommodation at Jägerhaus, so I planned to walk on to Trechtingshausen instead. The Soonwaldsteig website provides all the information one needs to plan the walk. However, I have found the Outdooractive website to be the best resource for planning any hiking trip in Germany. Researching a summer hiking trip on this website is a very satisfying way of spending a winter evening. Despite having used the Deuter App to download the trip information and maps from Outdooractive to both my iPhone and Android tablet, I did purchase the Publicpress map and Wanderführer to take on my trip. Booking accommodation was not difficult and I made all my reservations in April 2015. I reserved hotels at Saarbrücken, Rheinböllen, Trechtingshausen and Rüdesheim on the Booking.com website. The other three hotels were reserved via the Gastlandschaften Tourist Portal. Once I had all accommodations secured, it was then time to arrange transportation. On last year's Saar-Hunsrück-Steig trip, I went by train, taking the Eurostar to Brussels and changing onto an InterCity Express to Luxembourg (as described on the excellent "Man in Seat 61" website). That had been a a good option, so again I bought a return Eurostar ticket to "any station in Belgium" for £76 (£3 cheaper than last year!). A month before my trip, I bought a round-trip ticket from Arlon to Luxembourg from the SNCB website (Arlon is the nearest Belgian station to Luxembourg). From Luxembourg's railway station, the Luxembourg-Saarbrücken-Express bus takes one to Saarbrücken Hauptbahnof, where a direct train service (70 minutes) to the trailhead at Kirn is available. My Soonwaldsteig walk was at risk of being cancelled, because a few weeks after my Querweg walk, I was experiencing some chest pains and dizziness, so visited the hospital. I was admitted and initially diagnosed as having experienced a heart attack. After 11 days of care and many tests including an Angiogram, CT Scan, Echo Scan, MRI Scan and chest x-rays, it was concluded there was absolutely nothing wrong with my lungs or major arteries and I'd probably had a chest infection instead of a heart attack. However the cardiologist did note that the heart murmur I've had for the last 10 years is more pronounced and would cause breathlessness and dizziness due to aortic regurgitation. This explains why I tire easily on big uphill walks and I was told that I will require an aortic valve replacement some time in the next year or so. Anyway, the consultant passed me as fit and OK to walk the Soonwaldsteig and I was discharged on 11th August. I was really impressed with the level of care provided by our National Health Service.